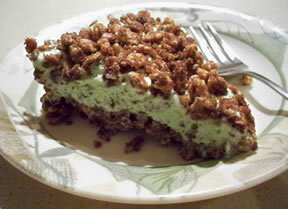 Girl Scout Thin Mints work perfectly for this recipe but I believe the Keebler ones will also work great. 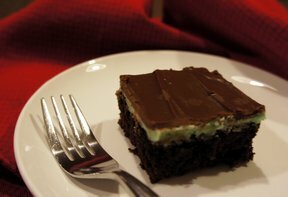 Mint and chocolate topped off with a fudgy layer along with a whipped topping that melts in your mouth. It'll be hard to resist a second piece! Prepare and bake the cake mix in a 9x13 baking dish. Allow to cool completely. Use the bottom of a wooden spoon to poke holes evenly across the entire cake (about 20 holes). Pour the can of sweetened condensed milk over the cake, trying to fill the holes. Heat the hot fudge sauce in a small bowl in the microwave. 30-40 seconds should do the trick, you jut want it to soften a little. Crumble half of the fudge mint cookies into the hot fudge sauce and mix. Spread the cookie/fudge sauce over the cake. 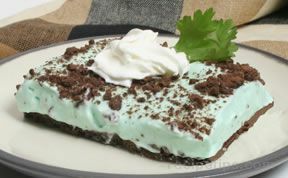 In a large bowl, whisk together the mint extract, food coloring and the whipped topping. Spread the whipped topping over the fudge layer. Crumble the remaining cookie crumbs over top of the whopped topping. 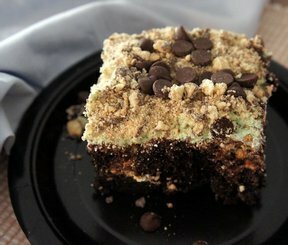 Sprinkle the mint chips over the top. Refrigerate and chill for at least 4 hours, overnight is best. "OMG, this is SO GOOD! I made 2 pans of this and froze it since I brought it to the lake. I thawed it out the morning before we ate it and it was delicious. Everyone loved it. I think some even had a piece for breakfast the next day."